Free Expedited Shipping 1-2 Business days! Knee discomfort has in recent times has been on the rise with a lot of knee surgeries being reported in North American high schools due to active sports. GenuTrain is a leading edge brace from 21st century which not only helps in preventing injuries but helps in recovering faster from surgeries. For patients having osteoarthritis or Osgood-Schlatter´s disease this knee brace has been voted as one of the best braces for pain relief by physicians. Your knee patella is covered by a ring shaped pad which will relieve pressure on your knee and provide a cushion effect. While you are on the move you will get a “moving Massage effect”. The stays on each side of the brace help in preventing any free flowing movement of the knee which might end up in a bad injury. Maintaining the shape of your knee is very important. Some of the braces in marked are made with material which is non-breathable and it makes it uncomfortable to wear it for longer times. Genutrain knee brace was made using meshed material which helps in free flow of air and a comfortable wear. Patient should bend their knee to 30 degrees and hold it in that position. With a measuring tape check the circumference of your leg 14cm above your patella and 12 cm below it. For your help we have provided a picture below with instructions. My son is a basketball player but from some time he couldn't concentrate on his game due to pain and swelling in his knee. His physio suggested to use this brace and it worked. My son loved it. The size is perfect for him and it is so comfortable to wear. I am so pleased to see him back on his game. Thanks. Highly recommended for those suffering with knee problems. I am an athlete. Last month, I suffered with a tear in my knee, due to which I couldn't be on ground and practice. I tried many products but they didn't really work. Then I discovered Bauerfiend Genutrain knee brace. This was the best knee support I ever bought. I was very impressed.They are easy to wear and comfortable. If you are suffering from knee strains,pains or swelling, but it now. I had a bad knee sprain and my physio suggested me to use this knee brace. I am amazed at how it worked. I must say that this is the best support I have ever used. what a relief. Very useful for those suffering with knee problems. I ordered this brace for curing my knee injury and I must say what a quick delivery. This is exactly what I needed. It is the best knee brace I have ever used. I loved it and I really appreciate the courteous and helpful staff. Thanks. I had to go through a knee surgery but my doctor told me to use this product before the surgery to minimize the pain. I am glad I ordered it. It fulfilled the purpose. I must say this is exactly what I was looking for. I can not skip to mention the fantastic support and follow up by the staff. Thanks a lot. I ordered this product as my knee was in a bad pain. I have used 3-4 knee braces earlier but I must say, this was the best. So comfortable and helpful. It worked properly on the pain and swelling and the result is that the condition of my knee is much better than before. Finally I got something I was looking for. Awesome! Fit perfectly. It is light weight,comfortable and provides the lot of support. An excellent knee brace and function perfectly. An excellent brace. I had a bad knee pain. I have used many knee braces but I must say that this brace is best among all. This knee brace is a great support while walking. It is breathable,comfortable and works well. I used Bauerfeind GenuTrain Knee Brace as I was going through bad knee pain. This made a significant difference. I have to go through a knee surgery next month but before that my knee requires proper support. This brace provided the required support and minimized the pain and selling. Very comfortable and easy to use brace. I had swelling and pain in my right knee. Pain gets worst while bending or walking and at times I felt stiffness in my knee. But after using this product, there is so much comfort and relaxation. I got relieved from the pain and there is no more swelling. This brace is the best aid for supporting painful and swollen knees. I definitely recommend this product to those suffering with knee issue. I had a knee surgery but my surgeon asked me to use this brace before operation as my knee was swollen badly. As per my doctor, swelling needs to be treated before surgery. I used Bauerfeind GenuTrain Knee Brace and was surprised to see the result. It worked amazingly on swelling and made my surgery easy. Thanks for such wonderful product. Recommended to those having post and pre operative swelling in the knees. An excellent product. It helps in relieving knee pain and works for swollen knees too. This product makes the knee more stable which makes the day to day activities more easy and comfortable. It prevents the pain and enhance mobilization. This brace is outstanding. I have used other braces in the past but this is by far the best brace, I have ever used. The best part about this product is that it creates compression support around the knee which prevents pain and swelling. It is easy to wear,comfortable and washable. I will recommend this product to those who are suffering with knee pain or swelling. A great investment. My knee is doing much better after using genutrain knee brace. Soft,comfortable,easy to clean. This brace provides the required support and flexibility. I would recommend this brace to someone going through knee issues. Bauerfeind GenuTrain Knee Brace provides gentle but firm compression which supports the knee.This brace is very comfortable,supportive and flexible. It works on knee soreness and pain. It cushions and massages the knee which in result gives significant relief. I have been struggling with a severe knee sprain. On a friend's suggestion, I ordered this knee brace. It worked like a magic wand. I wear it on my knee and it provides significant support which helps in minimizing the pain. A well made product with excellent quality and comfort. I will continue to use it. Before using genu train brace , I have used two other braces and the result was very disappointing. I had sore knees, there was bad stiffness. I am regularly using this brace and I feel that my knees are more flexible and there is no stiffness. I will continue to use it. This is my fifth purchase from your online store and I am looking forward to shop more as I am very happy and satisfied customer. I always get best price here. Easy to navigate site,wide range of products at reasonable price and quick shipping is really appreciable. I will recommend your site to my family and friends. I had a knee operation and there was severe pain and swelling post surgery. This brace really helped to recover. It cushions and massages the knee which helps in relieving the pain. Highly recommended for those suffering with knee problems. I bought this product for my son who is a basketball player. He sprained his knee while playing. there was severe pain and swelling near the knee area. He feels strain and pressure while walking. He is feeling relieved after using this brace. It provides support and stability to the knee and minimized the pain too. I always feel stiffness and pain in my knees. Tried couple of braces but they didn't work. Finally I got an amazing product. Genutrain knee brace. What a wonderful product. I am using it regularly and feeling the relief. No more stiffness is there. It has also lessened the pain. Highly recommended. Very comfortable and quite flexible than the thick brace I have been using. It provides support and also eases the pain and swelling. Outstanding brace. Worth every penny. I will recommend it to others. This is a high quality knee brace. Lightweight,comfortable and easy to wear brace. 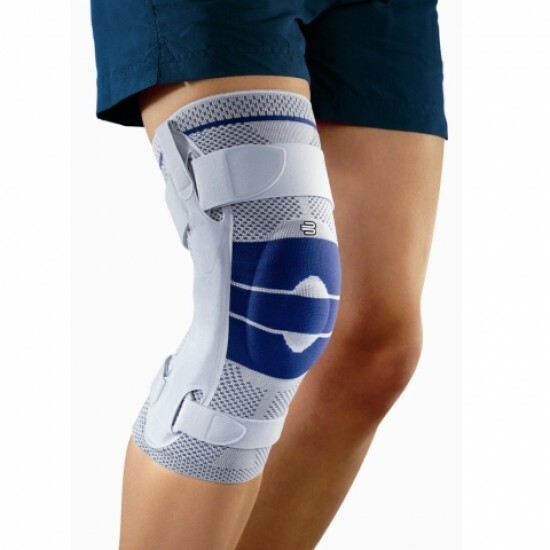 This brace has a significant impact in reducing knee pain. It helps in knee stability and lessens the swelling. It provides compression massage to the knees. This brace has helped me a lot in reducing the pain. It is comfortable and lightweight. This brace allows me to do my daily activities with comfort and ease. Its breathable fabric is gentle on skin and regulates moisture. This brace is very helpful and supportive in minimizing pain and swelling. This knee brace works fantastically on swollen and weak knees. It provides a massing effect which works like a cushion for knees and enhances the blood circulation. I am using it regularly and finding a tremendous improvement. I am feeling more comfort and ease while walking or sitting/standing.